Very regularly, GoPro brings a small evolution to its emblematic camera, bringing small corrections and improvements to what remains a reference, despite the strong competition. So here is version 7 for the Hero Black. The regular customers of the range will not be surprised in the handling, with a few exceptions of slightly different shortcuts. The others will have to go through a short learning time, also with a few small "aberrations" in terms of navigation, with a touch a little capricious. Voice control can be an effective alternative, but will depend on the sound environment for its effectiveness. Using one of the applications (iOS or Android) to control the camera is a very good thing, and easily replaces the small screen: it is however a pity to see that there are real differences in the functionalities of the applications. The photo quality of this GoPro Hero 7 Black is quite good, thanks to complete settings that go hand in hand with a fairly accurate and realistic final result, thanks also to a well-managed ISO mount. However, it is necessary to do with a rather long reaction time and some difficulties in case of weak light. For a one-time use, there is no reason to complain. In video, the real function of this camera action, you must first find yourself in the huge choice of formats and qualities offered, with a choice on stabilization or not. Each mode has its own specificity, but the quality is still very good , with a few points to note, such as the Full HD mode at 240 frames/second ideal for slow motion or modes to make videos with accelerated effect. The rendering is precise, contrasting and dynamic at the same time, flattering while remaining realistic. The stabilization now proposed has a decisive effect on quality, which is less subject to the risks of capture. This one benefits from a better sound, with a very successful wind management and parasitic character. The autonomy of this GoPro Hero 7 Black reaches about 80 minutes, which tends to require an external battery. A question or a problem on the GoPro Hero7 Black? Create a discussion and our team will answer you! 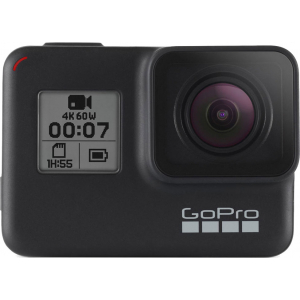 There is no opinion yet, be the first to add an opinion on the GoPro Hero7 Black. 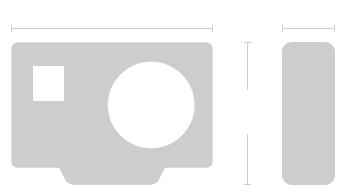 Information from the technical sheet of the GoPro Hero7 Black are only indicative, if you notice an error, please inform us with the icon displayed on the right of each specifications.